Staff Correspondent: The Chittagong Port has got three new gantry cranes on 14 August, which would boost the port's container handling capacity. The assembling of the new cranes will take a few weeks starting from the Eid vacation, said Md Zafar Alam, member for admin and planning at Chittagong Port Authority (CPA). 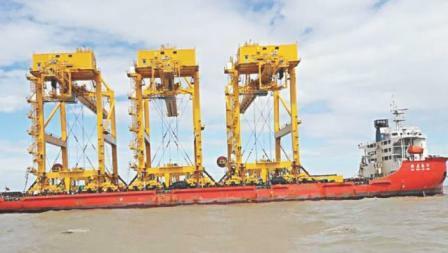 The three cranes are part of the six that the port authority purchased at Tk 344.92 crore on October 15 last year from Chinese company Shanghai Zhenhua Heavy Industries Company Ltd. The rest three may arrive in two months, Alam said. The CPA also signed a deal to purchase four more cranes last week, as part of its plan to bring in 10 cranes from the Chinese company at around Tk 600 crore. Currently, four such cranes are in operation at two jetties of Chittagong Container Terminal. They were bought for Tk 150 crore in October 2005. The purchase process for the 10 began when a New Mooring Container Terminal project was taken up a decade ago. The one-kilometre terminal with five jetties was constructed in 2007. It became operational in 2015 for delays in the appointment of a private operator. The port authorities have been encouraging the use of geared vessels for self-loading/discharging, which can handle a maximum of 15 containers every hour. Port users say the new cranes will double the rate. It currently takes 72 to 96 hours to complete container handling of vessels with 1,000 twenty-foot equivalent units capacity, said Ahsanul Huq Chowdhury, chairman of Bangladesh Shipping Agents Association. The new cranes will reduce the time to 48 hours if they are provided with enough space in the port yards, he said.